description for "Winter Squash and Pumpkins: Cucurbita maxima, 'Stella Blue Hokkaido'"
Cucurbita maxima 'Stella Blue Hokkaido' is an exceptional winter squash. 'Stella Blue Hokkaido' has sweet, richly flavored, fiberless flesh, delicious, dry, and almost flaky. Medium-sized, round, slightly flattened, blue fruits store well. Planting depth: 1 inch. Days to germination: 3-7 days. 95-105 days to maturity. 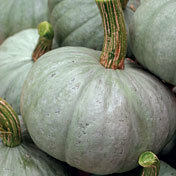 reviews for "Winter Squash and Pumpkins: Cucurbita maxima, 'Stella Blue Hokkaido'"